BSDTW ’17 was the first international BSD conference I’ve attended since BSDCan ’17, during which I was an intern at the FreeBSD Foundation. 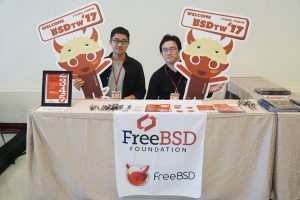 As a sophomore and a fairly new contributor to the project, the friendliness and inclusiveness of this community, and the degree of recognition that I have received for some of my small contributions really made me enjoy staying in the FreeBSD community and continuing to make contributions. After my internship, I became a FreeBSD committer and continued to be involved in the FreeBSD world. I appreciate that the FreeBSD Foundation provided me with the valuable opportunity to attend this years BSDTW in Taipei, Taiwan. 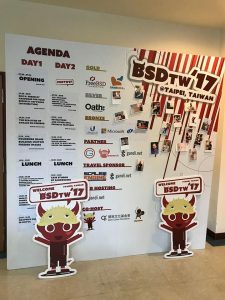 Before this year’s BSDTW ’17, BSD conferences have been missing Taiwan for more than a decade. During the opening of the conference, Li-Wen Hsu, the event organizer, reported that the attendance had exceeded their expectations, which is a great news. Then, I watched the presentations by Arun Thomas on RISC-V, George Neville-Neil on DTrace on FreeBSD, and Allan Jude on ZFS: Advanced Integration. I have been using / wanting to use these technologies in my daily life. Starting from basics while deep diving into technical details, these talks were all inspiring to me. In the afternoon while staffing the Foundation table with George Neville-Neil, I had a great time catching up and chatting with him. I also had the chance to meet and greet Kevin Lo and Ruey Cherng-Yu, two developers from Taiwan, who I worked with a lot online. We discussed the methodology and toolchain for documentation localization. I spent time meeting and catching up with friends and acquaintances. After the jam-packed first day, we gathered for a banquet dinner at La Villa Danshui, a restaurant right beside the beautiful Tamsui River. Developers, contributors, users and enthusiasts gathered together to review what they had learned that day and share their own stories. I met with Ben Woods, a ports committer from Australia, and he shared with me traps and pitfalls about FreeBSD Python ports, tips to make a better port, and how to become a ports committer. On the second day, I attended a few talks as well. I also staffed the booth, visited other booths, and spent a lot of time talking to different people. Mariusz Zaborski and I had a discussion on student involvement efforts for the FreeBSD Project. We shared his Google Summer of Code experiences as a student and later a mentor, and my internship experiences at the FreeBSD Foundation, to figure out how to get students more connected and committed to the project, which works on me as well. He also shared his ongoing work on Capsicum, followed by his great talk of Sandboxing the Base System with Capsicum. Per the request of the marketing staff, I took many photos during the event and shared them on both the official Foundation social media and my personal accounts. These helped attract interest to the conference itself and to the FreeBSD Project. At the same time, I felt so excited to take photos with a lot of famous developers whose aliases I can easily recognize in commit messages or IRC channels. Meeting and talking with them in person was an inspiring and fun experience. Staffing the FreeBSD Foundation table turned out to be one of the most enjoyable parts of the conference. Several developers recognized me from previous Foundation blog posts and the BSDNow interview. They came up and shared their common interests and WIPs with me, and I had a good time sharing my experiences and learning from them as well. Also, with the conference being in Taiwan, we had a lot of local students and enthusiasts who may have been able to attend other BSD conferences. I shared my experiences of getting involved and will keep contributing with many of them. I brought my Raspberry Pi running FreeBSD 12-CURRENT and an LED screen for demo. Sadly, the system broke during a recent update due to the instability of the -CURRENT branch where FreeBSD development on arm64 actively takes place. It took some time for reconfiguration, but it still attracted a lot of attention. People excitedly talked to me about their experiences with FreeBSD and IoT, asked me about the status of FreeBSD on arm64, or were just surprised that FreeBSD can run on IoT devices. A majority of them expressed interest to have their own IoT devices running FreeBSD. Overall, the trip to BSDTW was great. I left with inspiring new knowledge and ideas, new friendships, and a long to-do list. I appreciate the travel grant from the FreeBSD Foundation to cover my trip. I would like to express my thanks to Li-Wen Hsu and all of the conference staff, not only for their great work to host such an amazing conference, but also for assisting me (a traveller from Mainland China) with my travel documents and approvals, making it possible for me to experience the conference in person. I am super grateful for the encouragement and guidance from my former supervisor Ed Maste and other Foundation staff members, and all the help from this awesome community. Without your continuous care and support, I probably wouldn’t be able to stick around and participate in awesome events like this one.I would definitely regret that. I am looking forward to future events like this where I can meet and catch up with friends and acquaintances, spread my knowledge and passion on FreeBSD, and learn a ton. See you guys all next year!